Viewing 24 of 349 items. Set of modern and trendy soft white flat note cards personalized with your name and initial on luxurious 100% cotton stock. Your choice of paper weight. Cards measure 6.25" x 4.5". 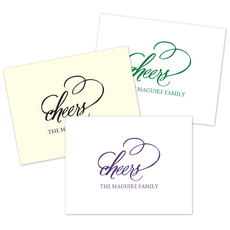 Matching..
Our elegant and refined Cheers design is the perfect sentiment over your personalization for many type of note card uses. Flat printed in typestyle as shown with your choice of ink color. Size.. Happy graduation! 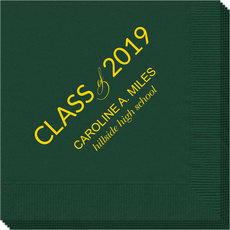 These quality photo napkins will be picture perfect for your grad party. This is a set of white 3 ply photo napkins which offers a nice large space for your digitally printed image.. This set of beautiful floral foldover placecards are ideal for winter weddings, holiday dinners or bridal showers. Size 3.5" x 2.5". Flat printed in in your choice of ink color and.. 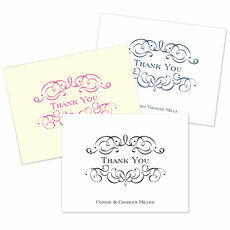 These modern and trendy foldover thank you note cards are perfect for your notes to friends and family. printed in your choice of raised ink and stock color. Size 5.5" x 4.25". Matching..
Set of soft white flat note cards personalized with your name on luxurious 100% cotton stock. Your choice of paper weight. Cards measure 6.25" x 4.5". Matching blank envelopes included. 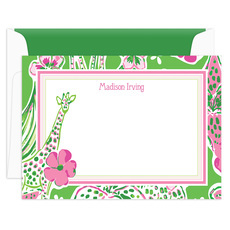 Your..
A fun set of personalized stationery featuring a whimsical giraffe jungle theme and the giraffe peeks out into your message. 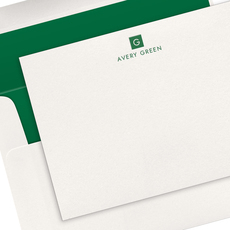 Matching blank white envelopes included. Note cards are 6.25" x 4.5" in.. 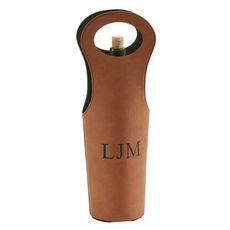 Present your next bottle of wine in style with our personalized caramel colored leatherette wine holder. This holder is 14.5" H. Your choice of personalization style. 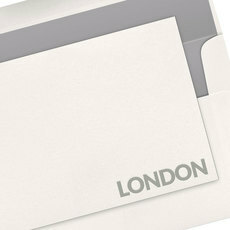 Your engraved..
Set of soft white flat note cards on luxurious 100% cotton stock with a trendy scattered dot design. Your choice of paper weight. Cards measure 6.25" x 4.5". 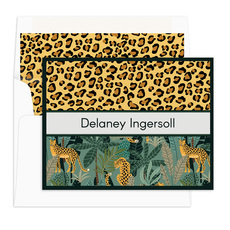 Matching blank envelopes..
Make an impressive statement to friends and family with this set of personalized stationery that features a wild design. Matching blank white envelopes included. Note cards are 5.5" x 4.25" in size. ..
Set of soft 100% cotton white flat note cards personalized with your name and sentiment of your choice. Your choice of paper weight. Cards measure 6.25" x 4.5". Matching blank envelopes..
A personalized onesie for an adorable baby gift. made from 100% organic cotton. 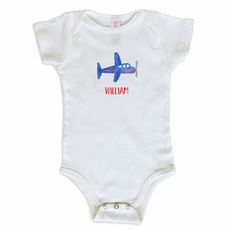 Onesies are available in sizes 3-6 months or 6-12 months. Offers a short sleeve with 3 snap closure. Typestyle and..
Set of foldover note cards with matching blank envelopes included. Card size is 4.25" x 5.5". Imprint is flat printed in ink color and typestyles of your choice. Printed return address in flat black.. 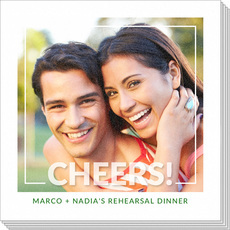 These quality photo napkins will be a perfect personal touch for your celebration. This is a set of white 3 ply photo napkins which offers a nice large space for your digitally printed images and..
A perfect desk accessory to help keep you organized. This product offers one line of personalization at the top of the square in your favorite typestyle and flat ink color. A beautiful rose design is.. 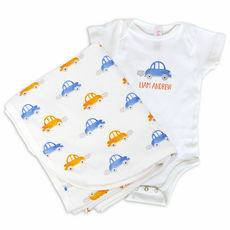 This adorable baby blanket and onesie set is made from 100% certified organic cotton and makes a wonderful baby gift. 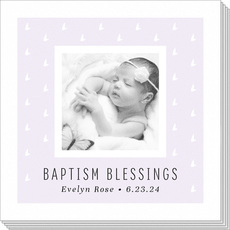 Natural white blanket is printed on one side and finished with natural white..
You've found our newest selection of personalized gifts, stationery and invitations. These are items we have added recently and we hope you will adore them too. We strive to continue to design and create products that are current, stylish and useful for the many celebrations and occasions in life. We work hard to add the best of the best to the website for you to view. We hope you will enjoy searching through these products and finding your own favorites that you will fall in love with too.